TDS can be configured to allow its’ applications to consume map service data from a secured map server federated with an ArcGIS Portal. User launches a TDS application that has a data source which is pointing to a secure Map Server (federated with Portal for ArcGIS). The application will provide a dialog asking the user to “Sign In” with Portal. Note: It is necessary to have the user confirm this action in order to prevent the browser popup blocker from blocking the next step. Once the user clicks the SIGN IN button, a popup window will open, and the user will be presented with the Portal for ArcGIS authentication method (the exact method varies per Portal configuration). Once the user is authenticated, within Portal for ArcGIS, the popup window will close, the dialog will disappear, and the application will continue loading as normal. The token will automatically be refreshed with Portal (behind the scenes) for as long as it can. However, once the token can no longer be refreshed the user will be required to repeat steps 2 through 4 to obtain a new access token. Sign into your Portal for ArcGIS instance. Click Add Item > An Application. On the newly created Application page, click the Settings tab. Under the Application panel, enter the URL the to TDS Application Manager site. This will allow users to quickly launch TDS from within your Portal for ArcGIS site. Note: This URI must match the exact URL that will be used to access TDS. Note: It is recommended to add both http and https protocols. Note: It is recommended to add both the external domain (if applicable) as well as the PC name of the TDS server (or whatever URLs will be used to access the TDS site), to cover both internal and external access (if applicable). Click Update to accept the added Redirect URIs. Make note of the App ID value. You will need it to enable Portal for ArcGIS authentication for your data source in App Manager. 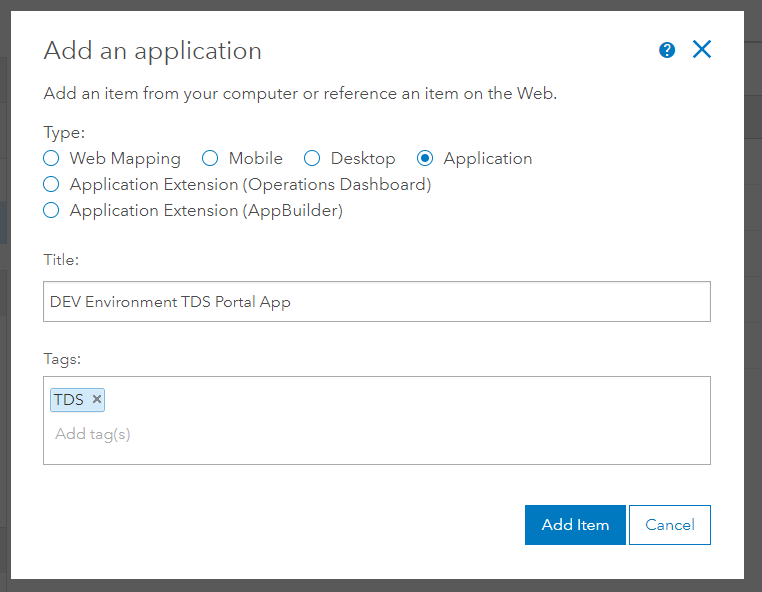 Load App Manager (TDS) application and log in with an Administrator account. Go to the Administration page (button is accessible from the top navigation bar). Click the Application Settings link under the Applications group heading. 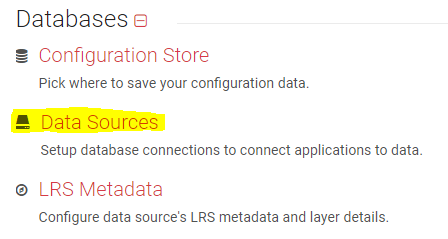 Enter an ArcGIS Server Geometry Service URL that is hosted on the secured map service (federated with Portal for ArcGIS). 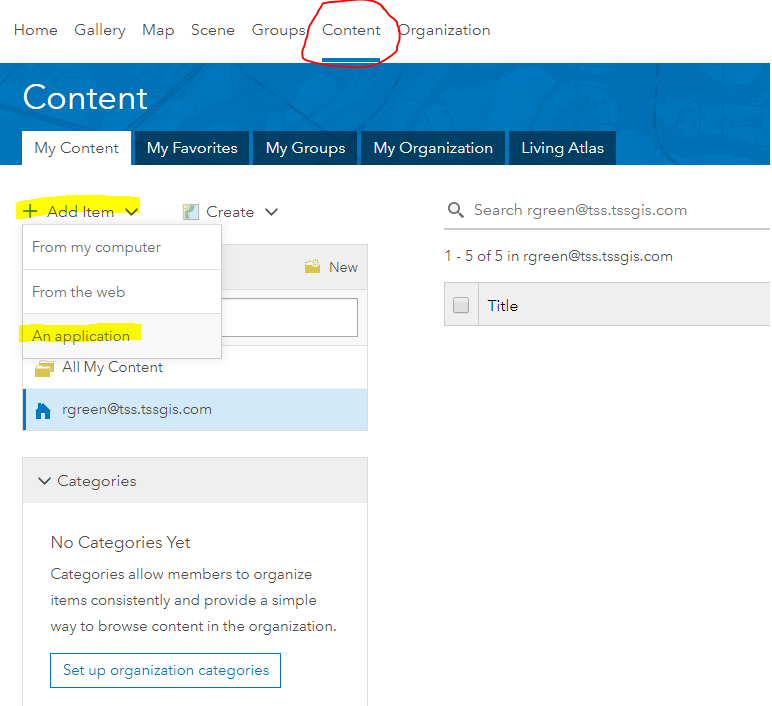 Enter an ArcGIS for Portal URL. Enter a Portal App ID which is the App ID value noted in the previous step above. Click the Save button (located in the bottom right corner of the page). Portal is now configured within TDS, however an application will only try to authenticate with Portal for ArcGIS when a data source is marked as “Service requires ArcGIS for Portal authorization”. See below to enable that setting. Navigate to the Administration page within TDS’s App Manager. Select the Data Sources link under the Databases group heading. Edit (or create) the data source that is configured to use a secure map service (federated with Portal for ArcGIS). Ensure that the Associated Service URL is configured to point directly to the secure map service. Check the Service requires ArcGIS for Portal authorization check box option. Any application that uses this data source will now initiate the sign in process with Portal (when applicable). Load an application profile that is using a data source that is marked as Service requires ArcGIS for Portal authorization. Ensure that the application prompts the user to authenticate with Portal for ArcGIS (as described in the “Functionality Overview” section above). Issue: This message means that the redirect URL configured within Portal for ArcGIS is not the same URL that the user is accessing the site from. Solution: Compare the base of the URL from the browser of the application with the URL that was configured with Portal for ArcGIS. Update the “Redirect URI” to include a valid URL. Tip: You can copy the URL of the popup window and run the URL through any HTML/URL decoder to see what the exact redirect URL is being passed to Portal (it will be present as a query parameter named “redirect_uri”.